Happy Tuesday everyone! Are you ready for some more peeks at the June Release from Newton's Nook? Today we are showcasing the new set called "Furr-ever Friends". This is one of those sets you don't really want to have to use but sometimes we need a Pet Sympathy card. I die cut a piece of Bristol cardstock and created a background with a cloud stencil and some Distress Ink. 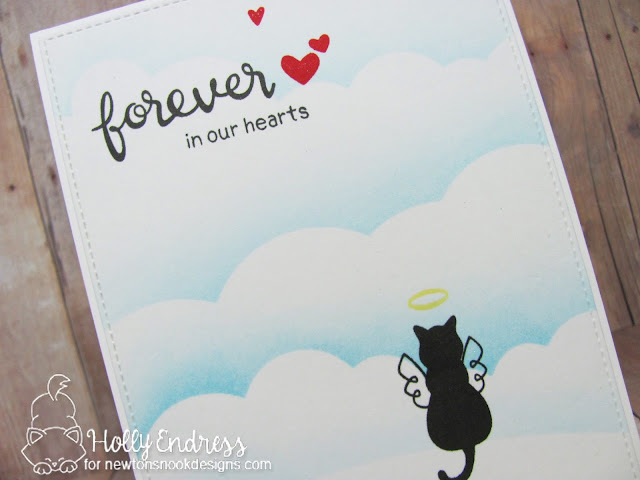 Then I stamped the sentiment and the kitty silhouette in some VersaFine Black Ink so I'd get a Crisp image. Then I stamped the hearts in some Red ink and the Halo in some Yellow Ink. I adhered the panel to a top folding A2 size card base. Then I added some Clear Wink of Stella to the Wings, Halo, and Hearts. You want to be careful when adding Wink of Stella over Water Based Dye inks because it will lift the color. This stamp set has some great images and sentiments. I love your design! And these wings could be used on many other images. So sweet! I love you sky!! I can picture that halo with a naughty kitty or pup disaster behind them, too! I love this - I lost my 13 year old pug, Astro, on June 4th. I have been looking for a tasteful, and not too cutesy way to do cards for the loss of a pet, and this set is perfect! Your card is wonderful. I love how you positioned the kitty in the clouds. Your card is so sweet! 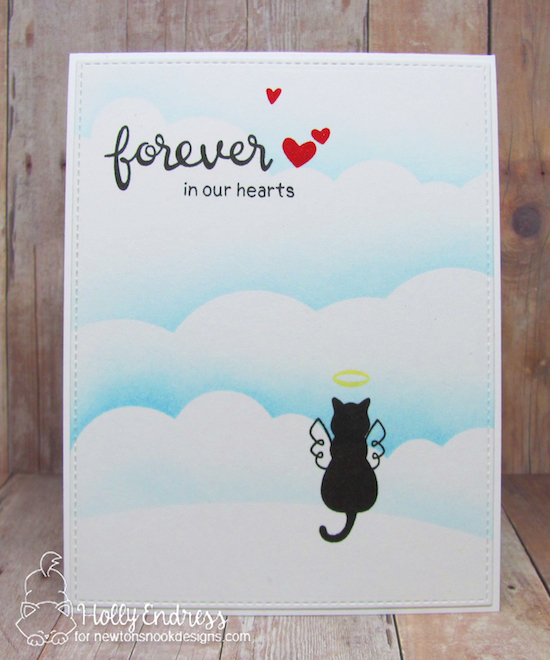 I love your inclusion of the heavenly clouds in this elegant and touching sympathy card. So sweet. I like the clouds and the hearts. I love the additin of clouds.Beautiful! This is so pretty!! I love how you did the cloud effect!! Such a wonderful sweet and needed set. Truly a very beautiful card for someone, they will love it!!! Very sweet card. Beautiful clouds! Such a sweet card! Love the clouds and angel wings! Beautiful card! I love the clouds and that sweet kitty silhouette! Simply beautiful!!! Love the clean and simple look of this card!!! Beautiful designed cards! Love the animals as angels in the clouds. Love this card...and love this set. I have to have it. Thanks for sharing your inspiration with us. A great idea for a stamp set! 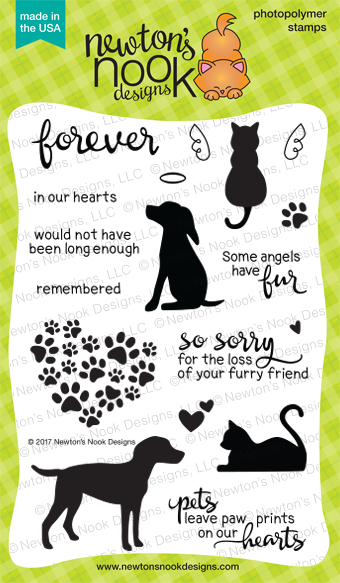 I think few people receive cards for the loss of a pet, and that cards acknowledging the loss of a creature they loved, would be welcome. Breaks my heart, but is a lovely card. Love. Such a sweet set and the cards are gorgeous. The way you did this card, it really touches the heart. Great work! This is a must have stamp set, what a nice card.